What is the Best Dog Food for Dogs with Allergies? Many dog owners do not realize that it is possible for a dog to have an allergic reaction to his food. In the same way that a person can be allergic to peanuts or wheat, a dog can also be allergic to certain ingredients in his food. If your dog suffers from food allergies, you may need to switch to a brand that is formulated to be free from common allergens. 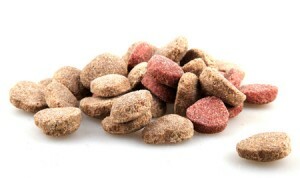 Allergies in dogs are more common than you might think and about 10% of allergy cases are the result of food allergies. Similar to humans, dogs can suffer from food intolerance as well, which is different from an allergy. If your dog is suffering from a food allergy, it may not be immediately apparent – it could take time for the allergy to develop and it might worsen if you switch to a new food. Some of the common symptoms of food allergies in dogs include ear inflammation, itchy skin, chronic diarrhea or gastrointestinal problems. In the case of food intolerance, your dog’s body physically cannot digest the specific ingredient – common symptoms of food intolerance include sensitive stomach issues such as gas, bloating, vomiting and diarrhea. Food allergies in dogs can be complicated because there are many possible causes. In most cases, however, the dog must have a genetic predisposition to the allergy in order to develop it. Puppies that are treated with antibiotics early in life may be predisposed to develop allergies and certain environmental factors may play a role as well. It is also possible that some breeds are more prone to developing food allergies than others – some examples include German Shepherds, Cocker Spaniels, Dachshunds and retrievers. Though your veterinarian may be able to make a tentative diagnosis, the only way to truly confirm a food allergy is to try an elimination diet. To do this, you must switch your dog to an entirely new dog food and then reintroduce certain ingredients to see which one causes the problem. Another option is to simply switch your dog to a hypoallergenic dog food – if this solves the problem, there is no need to test for the particular allergen that gives your dog a reaction. A hypoallergenic dog food is simply a food formulated from limited or novel ingredients. Many hypoallergenic formulas rely on natural foods that are unlikely to provoke an allergic reaction – foods that are likely to cause a reaction include beef, dairy, corn, wheat, soy and yeast. To create a dog food free from these ingredients, manufacturers may turn to novel ingredients like buffalo, kangaroo or pheasant. Remember, when switching your dog to a new food it is important to make the transition slowly. Start by mixing a 50/50 ratio of the new food with your dog’s old food and slowly add more of the new food until the old food is replaced entirely. The condition of your dog’s skin may be an indication of his overall health – if his skin isn’t looking its best, it is probably a sign of a health problem. While some skin problems are the result of injury, infections or parasites, skin allergies are also a common culprit. Some of the most common symptoms of skin problems in dogs include excessive scratching or licking, redness or inflammation, scabs, flaky skin, rashes, swelling and hot spots. Your dog’s allergies could be caused by a variety of things – one of the most common causes is fleas. Not only do flea bites cause irritation to your dog’s skin, but your dog could actually have an allergic reaction to the flea’s saliva. Mange, a condition caused by an infection resulting from scabei mites, presents in ways very similar to an allergic reaction. Some dogs may develop seasonal allergies to substances like weeds, pollen and dust and others might develop reactions to certain food ingredients. There is nothing quite as wonderful as running your hand through your dog’s soft, shiny coat. But what if your dog’s coat is matted and uneven or his skin dry and flaking? Skin problems are fairly common in dogs and, luckily, they are not impossible to resolve. The key to treating your dog’s skin allergies is to identify the cause. Speak to your veterinarian about the potential causes for your dog’s allergies or try to isolate it yourself by removing certain allergens from the environment to see if your dog improves. In addition to these measures, you might also want to consider switching your dog to a sensitive skin formula for dog food. These formulas are designed specifically for dogs with itchy skin – they often contain high-quality protein and plenty of essential fatty acids to support your dog’s skin and coat health. These foods are also often made without common allergens like corn, wheat and yeast in case your dog’s skin problems are the result of a food allergy. Your dog’s coat should be shiny and healthy – a reflection of his inner health. If your dog is suffering from skin allergies, don’t wait any longer to find him the relief he deserves.